The uptake of baculovirus and plasmid DNAs by insect cells are essential steps in the process of producing recombinant viruses and recombinant proteins in vitro. The most commonly used method for insect cell transfection by both baculovirus and plasmid DNAs is calcium phosphate precipitation, and while this chemical works to some extent, it widely considered as a relatively inefficient and inconsistent method. 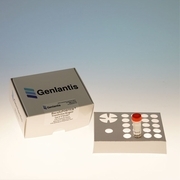 For this reason, Genlantis has screened for a lipid that is highly effective in insect cells, and developed and easy-to-use protocol and yields consistent results. The BaculoPORTER� Transfection Reagent gives researchers the ability to maximize the delivery of DNAs, such as transfer vectors and/or baculovirus DNAs (including bacmid DNA), into insect cells.